On EDUCAUSE I came across an interesting article by Ken A. Graetz with the title The Psychology of Learning Environments (view the HTML or PDF version) in which he describes some interesting ideas about how to make traditional classroom more collaborative, engaging and even enchanting for students. Although educational institutes don’t always have the flexibility to reorganize classroom and teaching methods, I think that there is always something we can do to make learning environments a bit more student and learning friendly. Speaking from my experience as a student, I think there are few that things more frustrating than obligatory lectures during which teachers have monologues and they think they are making lectures interactive by using bulleted power point presentations crammed with text. And not surprisingly, I rarely seemed to remember the general idea behind the lecture (even though I had no high or low tech gadgets to distract me). But on the other hand I had no problems with attending lectures that were well presented and after the lectures I often went online to learn more about bits that were particularly interesting and for this lectures I can really say that I learned a lot. 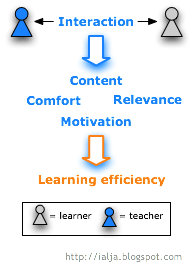 So, once again I think that our key question as educators should be: “How can we make learners want to learn this?”. If we find ways to engage students learning can be efficient and fun in both traditional and virtual classroom - and the psychology of learning environments can also be a factor in making learning work, but it can’t be the only one. If I make reference to the example of an enchanting classroom that was used in the classroom: the Divination classroom surely managed to capture Harry Potter’s attention on the first day, but poor teaching methods made him drop out of the class later on ;) So, I think that we should definitely try to enchant students with comfortable learning environments and also with relevant content that will be delivered in such a way that it will motivate students - learning is after a challenging and valuable process when we want it and when we feel comfortable in doing it!